SAN FRANCISCO--(BUSINESS WIRE)--Cybersecurity is now front and center on organizations’ boardroom agendas, but most chief information security officers (CISOs) have yet to earn a seat at the table. According to a study by ISACA and RSA Conference, 82 percent of cybersecurity and information security professionals polled in the survey report that their board of directors is concerned or very concerned about cybersecurity, but only 1 in 7 (14 percent) CISOs reports to the CEO. This gap between belief and actions at the highest levels of management is playing out in an environment where 74 percent of security professionals expect a cyberattack in 2016 and 30 percent experience phishing attacks every day, according to the ISACA/RSA Conference State of Cybersecurity study. The cybersecurity skills gap poses its own threat to keeping an enterprise safe. The past year saw a 12-point drop in the percentage of security professionals who are confident in their team’s ability to detect and respond to incidents, dipping from 87 percent in 2014 to 75 percent in 2015. Among those 75 percent, 6 in 10 do not believe their staff can handle anything beyond simple cybersecurity incidents. In addition, the number who say that fewer than half of job candidates were considered “qualified upon hire” has risen from 50 percent to 59 percent in a year. Twenty-seven percent need six months to fill a cybersecurity position, up three points from 2014. Despite the fact that most CISOs report into an organization’s technology function, this year’s study shows encouraging signs that cybersecurity does earn respect. Among those surveyed, 61 percent expect their cybersecurity budget to increase in 2016 and 75 percent say their organization’s cybersecurity strategy now aligns to enterprise objectives. Lawinski and Hale will present a session on these findings and their implications at RSA Conference on Thursday, March 3. The survey is the second annual State of Cybersecurity study from RSA Conference and ISACA’s Cybersecurity Nexus (CSX). Full results are available at www.isaca.org/state-of-cybersecurity-2016. ISACA created CSX to help address a growing worldwide cybersecurity skills crisis. CSX is a central location of cybersecurity research, guidance, certificates and certifications, education, mentoring and community. ISACA recently introduced skills-based training with performance-based exams and CSX certifications. ISACA (www.isaca.org) helps global professionals lead, adapt and assure trust in an evolving digital world by offering innovative and world-class knowledge, standards, networking, credentialing and career development. Established in 1969, ISACA is a global nonprofit association of 140,000 professionals in 180 countries. RSA® Conference is the premier series of global events where the world talks security and leadership gathers, advances and emerges. For information on events, online programming and the most up-to-date news pertaining to the information security industry visit www.rsaconference.com. 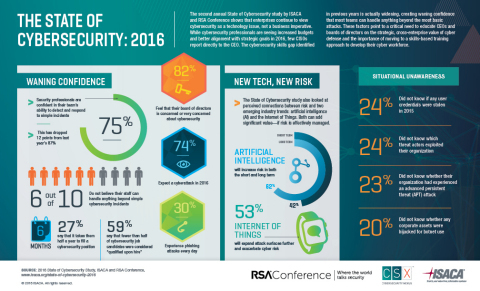 RSA Conference and global IT and cybersecurity association ISACA released results today of a joint study on the state of cybersecurity in 2016. The survey shows the skills gap is getting even wider.